On 26 October the Tilburg Culture Night takes place. Above the railway you can enjoy a meal typical for Tilburg. You eat the different courses at three locations around the Wilhelminark: soup at Museum De Pont, the main course at Textile Museum and a desert at Park. Meal vouchers are available at the Pont for only €13. Bon appetit! As another nice joint initiative between the three locations, you can hop on a special bike with a fellow townsman. Jump on! At Museum De Pontyou will eat 'Tilburg Word Vermicelli Soup'. Open from 13:13 to 20:13 pm. The Pont asked ten poets to write a poem inspired by one of the works from the permanent collection. This includes former townsman Ivo de Wijs, poetry slam performer Ellen Deckwitz, the young Flemish poet Delphine Le Compte and Esther Porcelijn. At the Textile Museum the main course typical for Tilburg ‘Slaoj meej aaj meej jèùn meej èèrepel’. Open from 13:13 to 21:13 pm, main course and metamorphosis from 17:00 pm. From 17:00 pm you can go here for a very special makeover. The ladies of Coupe Du Compress proceed with extreme tools. No hours of rituals with hair dryers, combs, styling and curling irons. With very unusual means they create a grand and eccentric effect. Man, woman, curly, frizzy, style, short or long; they tackle everything. Your look is also captured on a picture. PARK is open from 13:13 to 22:13 pm, showing the exhibition Reci-Pro-City. From 19:00 pm you can join for desert. This special 'Hangop' is accomponied by music from Aart Strootman (guitar, composition) and NielsBroos (piano, keyboards). In a musical way they explore the notion of reciprocity and take you on a discovery voyage. 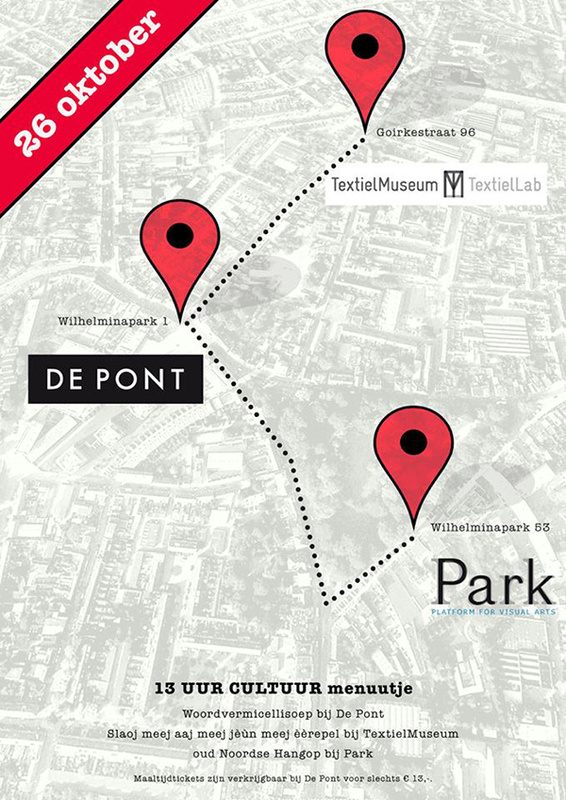 Museum De Pont closes its doors at 20:13 pm, Textile Museum at 21:13 pm and Park at 22:13 pm. Access to all three venues is free.